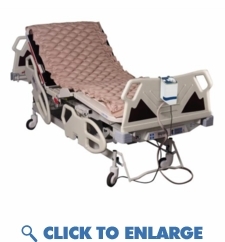 This Deluxe Alternating pressure pad system prevents bedsores and pressure ulcers. The pump operates on a 10 minute cycle time and produces 30% more air output than the standard system. The alternating pressure pad (app pad) system is designed to fit over a twin mattress, twin medical bed frame, and can also be used to fit over a recliner chair. The pump generates 6 liters of air per minute 30% more than standard models. Variable pressure setting on deluxe pump can be set for comfort and maximum inflate. The pad is made of long lasting durable heavy gauge premium vinyl. New improved quiet pump technology alternately inflates and deflates over a 10 minute cycle.